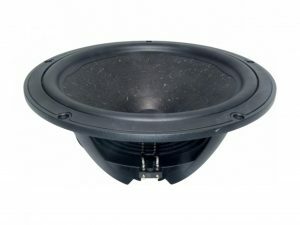 This 12 inch 4 ohm member of the NE family has leading-edge transducer technology packaged in a cutting edge, stylistic design. The subwoofers in this family feature an innovative cast aluminium basket design which minimizes acoustic reflections inside the driver, through large basket windows and sculpted basket spokes. The basket also is designed to act as a highly coupled heat sink to the NdFeB motor, so as to improve power handling capacity. An additional heat sink is available to provide extra thermal protection if needed. The cone and dust cap are constructed of natural wood fiber material with proprietary coating formulas &amp;amp;amp; processes, so as to yield high clarity products. The cone designs also utilize pentacone technology for improved frequency response. The voice coil bobbin is titanium, for improved performance. The FEA-designed motor features copper caps to minimize inductance and extend performance to high frequencies. Rounding out the design is a 4-way terminal block connector, for ease of electrical connection.